Today’s guest post comes to you from Larry of Janis Gardens Cooking Companion Hope you are enjoying the guest posts this week. Grilled vegetables make a wonderful way to showcase the bounty of your garden. They are also an excellent addition to any meal be it a family get together in the patio, a more formal sit-down dinner, perhaps next to a warming campfire in the wilderness or tailgating at the local sports arena parking lot. Grills are very portable making grilled vegetables available almost anywhere you choose. Even electric grills do a credible job of grilling vegetables. When grilling a large quantity of vegetables, I use grilling foil and find it works very well and clean up is a breeze. 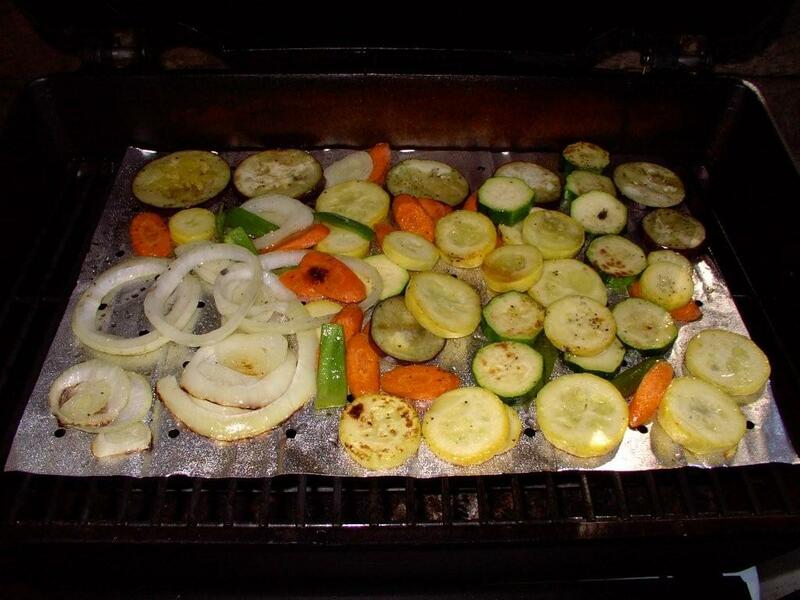 Larger vegetable slices can easily be done right on the grill grate. We need some help, however, with smaller pieces so they wont fall through the grate and into the fire. Perforated woks and pans are made especially for grilling small foods, including vegetables and sea food, and they work excellently. I use mine frequently. Lightly salt and pepper vegetable slices. A little practice and you will learn to slice the slower cooking vegetables thinner and the quick cooing vegetables in thicker slices. Drizzle with olive oil. Toss to coat evenly. If, using perforated wok or pan, cook over high heat stirring frequently. If cooking on grill foil, cook over medium-high heat stirring occasionally. Cook until vegetables are tender and are nicely browned. Remove from heat, sprinkle with lemon juice or herbed vinegar. If using prepared grilling foil, it already has a non-stick side. If using a grill wok, heat the wok over the fire, remove from flame before spraying lightly with non-stick spray. With chicken, turkey or pork, a sweeter dish might be appropriate. Mash a clove of garlic and add to ¼ cup of a red wine. Set aside. Prepare vegetables and cook a before. A few minutes before vegetables have completed cooking, mix reserved garlic and wine with ¼ cup of honey. Drizzle over cooking vegetables while stirring. The alcohol will flare – stand back and be careful. Remove from heat as soon as done – the sugar in the honey will burn easily. Or, as an alternative, try adding some slices of pineapple or slices of other favorite fleshy fruits to sweeten the dish. The vegetables can be marinated before grilling if you wish. A flavorful marinade can be made of 1/2 cup of red wine vinegar, to which a lightly crushed clove of garlic, thyme, basil, rosemary and oregano have been added. Slice vegetables, place in bowl, add marinade and toss. Cover bowl with plastic wrap and refrigerate for 15 minutes. Drain marinade and then grill vegetables until tender. Substituting soy sauce for salt can add flavor and a hint of the orient to your vegetables. Vegetable cooking times vary wildly depending on the density, structure and size of the vegetable pieces. There are three tacks that you can take. One is to vary the cooking time. The second is to vary the cutting thickness, making the denser vegetables thinner. And the third is to parboil the longer cooking-time vegetables. Away from home or camping, I start cooking the denser vegetables (cut thinner) first and, at intervals, add the other vegetables according to their cooking time. At home, or at least when I bother to plan ahead, I make uniform vegetable pieces and then parboil, or blanch, the denser vegetables to make cooking times for all the vegetables about the same. You can parboil the vegetables the day before and store, covered, in the refrigerator. Parboil each vegetable separate and scoop the precooked vegetables into iced water to stop cooking and preserve the color. Broccoli: Cut stalks in half lengthwise. Blanch 2-3 minutes. Grill 4-6 minutes. Corn: Remove husks. Do not add oil. No blanching. Grill for 10-12 minutes. Eggplant: Slice into 1 1/2 inch wedges. Blanch 2-3 minutes. Grill 12-15 minutes, turning once. Potatoes (thin-skinned, sweet, russet): Scrub well or peel. Cut length-wise into 1 inch wedges. Blanch 4-5 minutes. Grill 8-10 minutes. Squash: Cut in half length-wise. Blanch 2-3 minutes. Grill 8-10 minutes. This recipe and the techniques are just suggestions as there is no right or wrong way, method or assortment of vegetables. Times vary with the heat of your grill and whether you are on the grate, in a wok or on foil. Use this as a starting point and then develop your own favorite way of making and enjoying grilled vegetables. You will be pleased with the results and glad that you tried grilling your veggies. Oh, by the way. Now that you have mastered vegetable selection, preparation and blanching and mastered the grilling, I’d like to tell you how my sister, Pattie Sue, grills her vegetables. She doesn’t mix items on the skewers. She put all the same item on each skewer and everything on each skewer cooks in the same amount time. She says that even though the skewers don’t have the color mixture and presentation of the more familiar shis kabobs, it is quicker and easier without having to think about thick and thin slices and parboiling. THIS IS YUMMO LOOKING! GREAT JOB! my network followers. Thanks in advance and keep up the great work! Yum yum! I LOVE grilled veggies, I'm going to have to try zucchini grilled I haven't had that before. I'm stopping by from this week's Super Stalker Sunday hop! Thanks for participating! I hope you'll join us again next week and I hope you'll stop by and visit me if you haven't already! The zucchini and squash look AMAZING! I am vegetarian and I love grilling veggies. Grilled eggplant seasoned well is some of my favorite. I will have to try some of your recipes. Thanks for visiting my blog. I am your newest follower. I pinned this and loved the suggestions on blanching! Love me some veggies on the grill. Thanks for the tips!